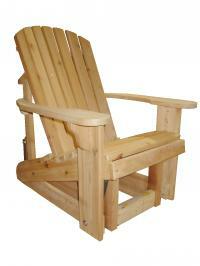 Adirondack Cedar Chairs, LLC. 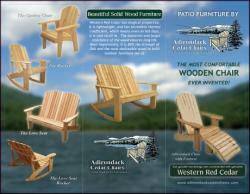 Top-selling Adirondack Chairs and other outdoor furniture.All built out of beautiful Western Red Cedar. 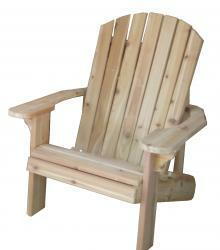 Top-selling Adirondack Chairs and other outdoor furniture. All built out of beautiful Western Red Cedar. 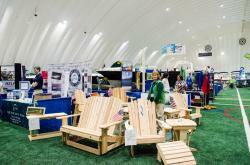 COME TRY OUT OUR FURNITURE FIRST HAND! March 22nd,23rd and 24th, 2019 HAND BUILT ONE AT A TIME! 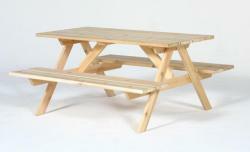 We use only select Western Red Cedar, since it is simply the finest, most desirable wood for outdoor furniture. It is lightweight, the resin is poisonous to insects, and it has an incredible thermal coefficient, which means even on hot days, it is cool to sit in. The bacterial and fungal resistance of the wood ensures long life. Click image to download our color brochure. Each piece is held firmly in place using 1 3/4" stainless steel fasteners, and special, elasticized polyurethane adhesive, to keep the chair rigid, even when put through -40 to 120 degree temperatures. Western Red Cedar is an appearance-grade wood. When properly coated with Sikkens Cetol, or Tung Oil, the grains stand out, providing high aesthetic appeal, and and long-lasting durability - even under severe conditions. 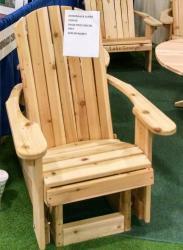 It is not uncommon for a properly stained Adirondack Chair to last 100 years, there are many in existence to prove it. These furniture pieces often become family heirlooms, and are handed down generations after generation, becoming sought after prizes for collectors. Whenever you invest in one of our pieces, rest assured that you are getting the finest craftsmanship available. These new items are specially designed with raised seating chairs and are an excellent choice for anyone who has trouble getting out of our Classic chairs. Any hip knee, and shoulder replacements, this is the design for you.